Many of you have sent comments to let me know how much you love my Christmas header. It is beautiful. The colours, the shape and form of the trees, its simplicity, modern design, etc etc. When you consider it was painted by a man who was born paralysed in both arms, it is even more impressive. As a drawer of wonky stick figures, it certainly takes my breath away. As I mentioned here, I am going to share more of these amazing Christmas cards painted by Mouth and Foot Painting Artists in the 70's, this month. They are all incredibly different, from traditional nativity scenes to cute trumpet playing 70's angels...I think most of you will find at least one you like. Irene Schricker was born in 1927. She worked as a clerk until she was 19 when she contracted spinal polio. Unable to work, she returned to painting which was a hobby of hers as a child. She died in 1991. I wish I could share more info about Irene, but unfortunately that's all my searches came up with. Please drop me a line if you know more about her, she must have been an incredible woman. p.s. speaking of cards, you could win a pack of lovely reread handmade ones here. Entries close on the 8th of December, so you'll have them in time for Christmas if you're the lucky duck who wins them. p.p.s. not all of the Nuns were ruler wielding meanies! 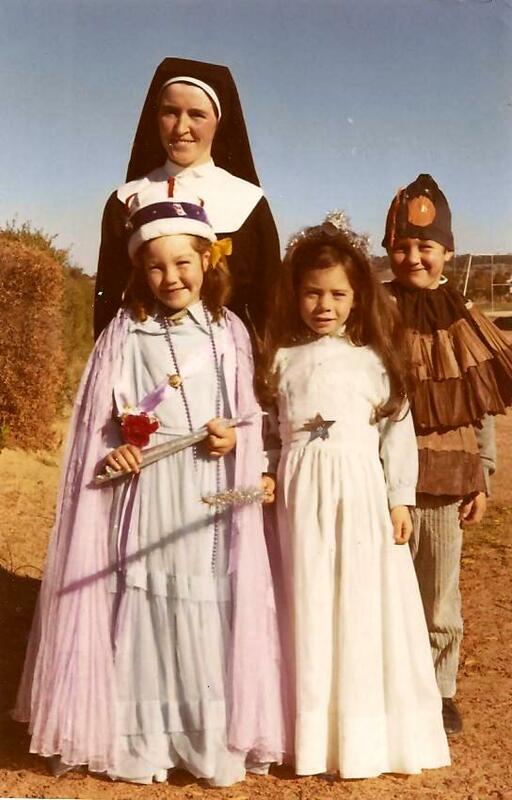 Here's a pic of me dressed up as Queen Elizabeth with one of the nice ones, Sister Elizabeth, taken in 1971. Kylie, the header is amazing! You are right -- the simplicity, the colors; it's just right! And thanks for the inspiration regarding the mouth and foot painters. It is humbling. Amazing cards and great photo! Where have I been? And you have been so busy. Tis the season I guess. I love the card at the tip top. All my favorite colors. And the nativity scene is really very nice. Mary's expression is perfect. My Nan used to buy the cards similar to these- 'painted by the mouth of' and 'painted by the toes of'. The skill and detail thet goes into them is amazing. Love the colours on the header - and the trees - and everything actually. You're right - it's beautiful. How do you paint with your mouth! I can't even draw decent stick figures - probably wonkier than yours - one of the gifts I've always wished I had is the ability to draw. Hi Kylie, Love the Christmas header and the beautiful nativity scene painting. You look so sweet in the pic too - love it!! Aw - such a cute photo, Kylie! The nativity card looks like stained glass, with its sections and the glowing colours. Lovely. Nuns... yeah, I guess there are good ones, but a lot of Twisted Sisters too... You looked cute as the Queen though! We used to get these cards every Christmas, I was fascinated by how good they were.